Big savings on this outlet deal! If you don't mind small cosmetic imperfections, these units have full performance and full warranty. They all come with our most recent BASH designed 200 watt class D amplifier in a refurbished cabinet. State of the art features. Great for both music and movies. 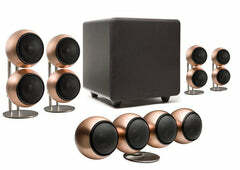 If you are looking for a subwoofer that can shine while playing both music and movie soundtracks, the Super Eight Subwoofer is for you. The Super Eight would be $599 if it were sold in traditional retail stores, but is available for $299 directly from Orb Audio, and is included in all of our Stereo and Home Theater Speaker Packages without all of those extra charges and markups. 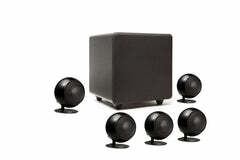 The Super Eight Subwoofer follows the same design principles as our Mod1 and Mod2 satellites. We use advanced audio design and high quality components to produce the most accurate, rich sound from a small, attractive enclosure. There are two ways to make a subwoofer produce bass. The first is to use a large enclosure and a less expensive driver and amplifier. This is the option taken by many of the mass market companies who need to keep costs down because of the hefty markups of their products on the way to the retail shelf. The second option is to use a smaller enclosure, a better amplifier and a higher quality driver. Obviously, since Orb Audio designs and manufactures high quality, small satellites, we chose the second path when we designed the Super Eight. We started with a sturdy, heavy duty cabinet, but limited it's size to about one foot square so that it would not eat up all the space you saved by choosing Mod1 or Mod2 Satellites. Then, we added a fantastic amplifier and a custom driver, which together can move a lot of air and produce deep, tight realistic bass. The Super Eight Subwoofer has an advanced BASH hybrid amplifier (brand new, current design), capable of producing 200 watts of continuous power and can peak, conservatively, at well over 400 watts. Add to this a high-tech driver with a heavy 30 ounce magnet, gold-plated inputs and binding posts, a high-quality crossover and Orb Audio stylish design. Although the Super Eight is acoustically matched to our Mod1 and Mod2 satellites, it is a good match to most other speaker systems that would normally require a larger subwoofer. The cabinet on the Super Eight measures 12" x 12" x 12" and will fit in with any decor, and in any space available in your room. It is one of the only compact subwoofers that can really outperform larger subwoofers that use enormous, space-wasting cabinets. The Super Eight is covered by a five year/one year limited warranty as well as our 30 Day Satisfaction Guarantee. Please see our FAQ and other links on this website for complete details. As always, we would love to hear from you if you have any questions, so please contact us via phone at 877-ORB-AUDIO (877-672-2834) or via email at support@orbaudio.com.